Does this purported iOS 8 screenshot out the iWatch? Or is it a fake? Does this Watch Utility icon look genuine to you? 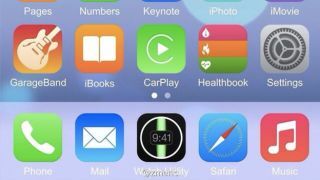 A new screenshot, claiming to show the forthcoming iOS 8 operating system, may offer some insight into a couple of hotly-anticipated rumoured Apple products. Within the screenshot, which emerged on Chinese social media this weekend, is an app called Watch Utility that, it's fair to assume would give iOS users access to the settings on the as-yet-unannounced iWatch. The picture also, shows a homescreen that is five icons wide. That would play into reports that the iPhone 6 will offer a larger display with a differing aspect ratio, compared to the one currently featuring on the iPhone 5 and iPhone 5S. However, whether the screenshot is the genuine article is another matter altogether. While the rest of the app icons appear to show familiar iOS 7-like designs, there's something that's not quite as polished as the Watch Utility icon, which sits in the centre of the dock within the screenshot. The screenshot also features the Healthbook app, which has been purportedly revealed in previous leaks. Do you think this picture is the real deal? Or is a hoax merchant at work? Let us know your thoughts in the comments section below.